Before we do the countdown to the new year and start living through those New Year’s resolutions, we’ve decided to take a look at not only the winners and losers, but also the embarrassing moments from the Zimbabwe technology space that we’ll gladly leave behind this year. Here are just five faux pas from 2014. 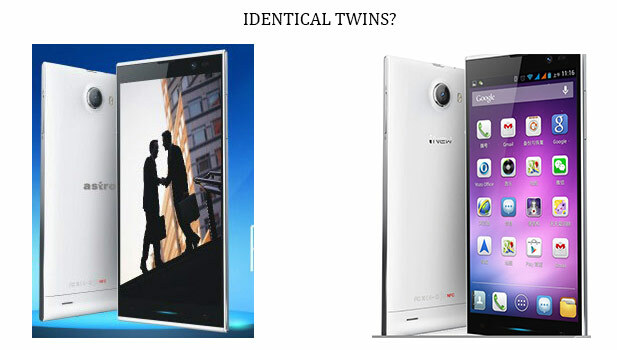 Remember when local device manufacturer/distributor Astro released their new Astro Virtual 2 phone? This was supposed to be the slimmest phone at the time (something that was also untrue) . Everything was OK with the new device and the market seemed to love it. Trouble only erupted when they claimed to have designed the device themselves, something that was dismissed as a lie after a tip off from one of our readers. This claim of original device design was later brought into dispute by an overwhelming amount of evidence pointing to Chinese patent ownership. We had hardly had gotten the chance to review local online ticketing startup Zimticket when the startup appeared one night as a guest on ZiFM radio. The show presenter, Ruvheneko Parirenyatwa, had a Q&A that turned out to be rather refreshing from a startup reviewer’s perspective as she bluntly called out the startup team on its shortcomings, and exposed it for what seemed to be a classic case of a startup not knowing its product. In the end Zimticket came out of the studio wiser and for every other startup the lesson was clear. Honesty and a lot of homework have to come before the media attention and accolades. Yes, there was a time Powertel had an unlimited internet package, but that all changed this year. 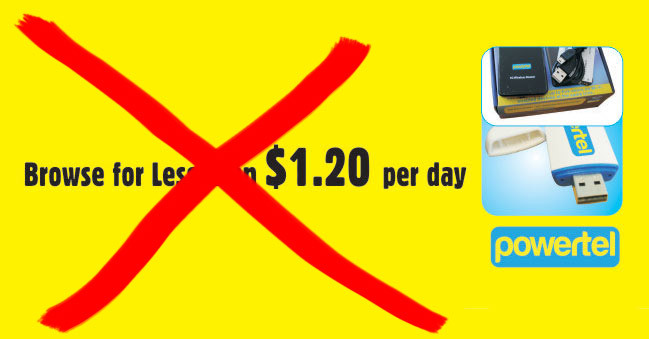 Despite the fact that this unlimited offer was one of the darlings of local internet service Powertel decided to play a very dangerous move when they pulled this winner from the roster. The result was pretty obvious. Subscribers left and our price sensitive market has been crying foul since. Despite a rebranding strategy and a fibre project penciled for next year the calls have been unanimous – Kill the usage based model and bring back the unlimited package or at least make your internet affordable. Social media can be a monster and this time it caught up with ZOL. In October the ISP launched an ad campaign for its ZOL Fibroniks. It was accompanied by a print advert which categorised male and female internet usage patterns. The inappropriate ad cast women as viewers of gossip and fashion, and men as fans of sport and work. 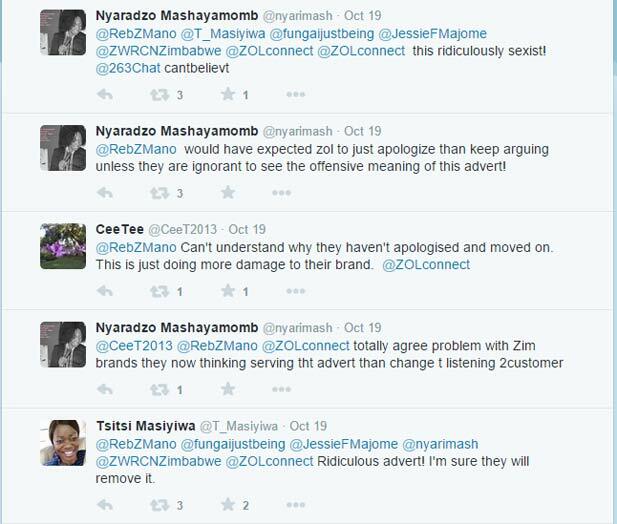 A multitude of #Twimbos had a lot to say about the inappropriate ad which culminated in a Twitter storm that only died down after apologies had been issued by ZOL and the advert had been pulled. The lesson here was simple; Make sure you have a product and a promotion that does not offend anyone. Review those catchy phrases thoroughly before approaching the market. 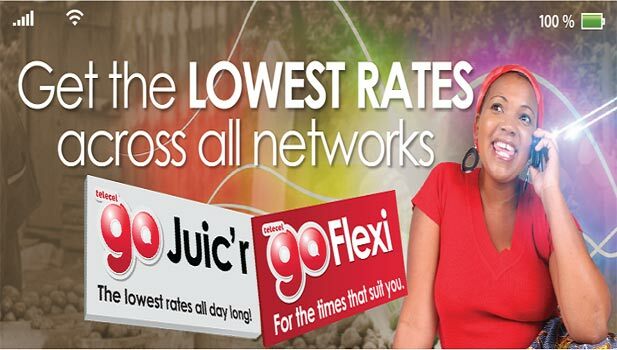 Sometime ago we sort of gave up on the whole tussle for subscribers between Econet and the other networks. The gap between subscriber totals doesn’t look like it can be closed anyway. Nevertheless Telecel hasn’t given up and they have every reason to keep up the fight. More subscribers mean more revenue and let’s not forget the allure they’ll have for potential investors. This is what birthed ideas like Number Matching which sounds like a smart work around for number portability. Telecel; If you are going to steal me away from NetOne or Econet please offer me something more than just 5 free minutes, 5 SMSes and 5MB of data. In a world where NetOne wants me to have unlimited on-net calls and where Econet wants to track my car (or whatever it is they are launching next) 5 texts isn’t much of a carrot. One wonders how Telecel approved this seriously. It’s safe to assume that the guys behind this promo have given up on this MNO fight and are probably waiting for whatever new investor that’s coming in to give the Red network a boost of confidence. Hopefully everyone involved in these gaffes, from service providers to startups, learnt enough to avoid such drama next year. There are obviously other blunders from the players in the Zimbabwe technology space we didn’t mention here. What stood out for you as a classic misstep? That was freaking hilarious: the way you mentioned the Econet part. Thanks for the laugh, and for the reminders.